ITBP Inspector General Manoj Singh Rawat of the North East Frontier Headquarters called on Chief Minister Pema Khandu today. During the call on, the duo discussed on the recruitment of Arunachali youths in the paramilitary force. 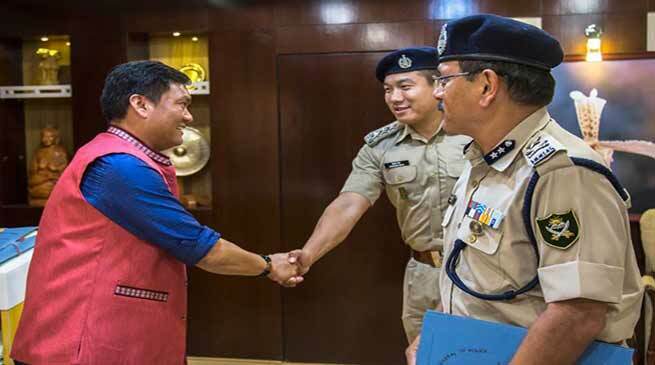 The Chief Minister felt that more number of Arunachali youths must be recruited in ITBP as the locals being familiar with the terrain can help paramilitary force become a formidable fighting force in the defence of our motherland. He also expressed that besides providing employment to the local youths, the force being permanently stationed in Arunachal the youths after being employed can be of help to the society. The Inspector General informed the Chief Minister that ITBP is taking measures to help locals in getting recruited to the force. It has been conducting training programmes for locals to crack the recruitment tests and exams.